BEST LOOKING CHAIR FOR OUTDOOR CEREMONIES OR RECEPTIONS, WEDDING, COUNTRY-CHIC, AND AUTUMN BANQUETS. ALSO CASUAL ENOUGH FOR LUNCHEONS, BRIDAL SHOWERS, AND DINNER PARTIES. 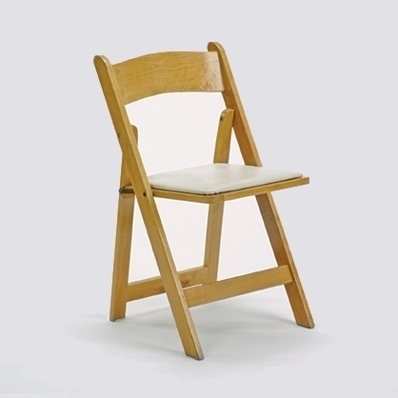 CLASSIC FOLDING CHAIR WITH A PADDED SEAT. CAN HOLD UP TO 400 POUNDS. * Please call us with any questions about our wood folding natural w/padded seat rental in Baltimore Metro area.